For the best in custom swag, look to Nike. Known around the world, Nike promotional products are sure to impress your employees, clients and potential clients at company events, business expos and other industry outings. Promotion Pros offers the best in personalized Nike promotional products, with everything from apparel, backpacks, coolers, umbrellas and golf accessories. Show off your brand with customized Nike swag to give away at corporate events, industry trade shows and to say thanks to current customers. The Nike Crush Extreme Golf Ball - 16 ball pack features soft cover for better control and feel and allows adding brand logo for impressive Company logo products. This Nike Golf Dri-FIT Fabric Mix 1/2-Zip cover-up showcases your company logo while offering pure comfort. This classic Nike Golf Dri-FIT Heather Pique Modern Fit Polo is a comfortable way for employees and staff to represent your brand. This classic Nike Golf Dri-FIT Sleeve Colorblock Modern Fit Polo is a comfortable, classy way for employees and staff to represent your brand. Everyone loves a warm Nike Golf Ladies Therma-FIT Hypervis Full-Zip Jacket to layer during the winter months. Employees will love a mid-weight Nike Golf Therma-FIT Hypervis 1/2-Zip Cover-Up to wear during the winter months. Our Nike Hyper Flight Golf Ball features soft feel and versatility and is perfect for customization with your brand logo for Brand Recognition. 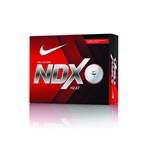 The Nike NDX Heat Golf Ball Set features surlyn cover and low compression core technology to create impressive Custom Giveaways with your brand logo. Our Nike Power Distance Long Golf Ball Set features multiple imprint locations and allows inserting brand details to create Custom Giveaways. Our Nike Power Distance Soft Golf Ball Set features enhanced soft game control and makes interesting Company logo products, Customizable with brand logo. Our Nike RZN White Golf Ball Set is perfect for printing your corporate logo for Brand Recognition. Our Nike RZN Black Golf Ball Set features softer compression and better feel and makes interesting Custom Logo Products with brand details.